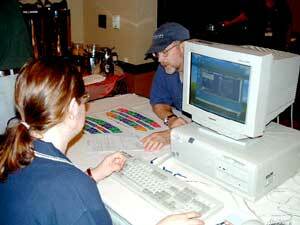 Super Three Ticket sales started this morning at 9 a.m. in the Westin Grand Bohemian Hotel in Downtown Orlando. Most fans started to gather around 6a.m. and some were even found camped out around the hotel before dawn. In the first hour over 150 groups of fans were in line to purchase the best seats for INVESCO Field at Mile High. Michael Strasser has been involved in the drum corps activity since 1969 and today he stood in line for three hours to purchase tickets for the 2004 World Championships in Denver, Co. Strasser said he bought two tickets, one for himself and one for a friend. "I love it! I love the activity and I like to see what's going on and what direction things are going." Strasser was a member of the Stardusters and the Bleu Raeders. He was also on staff for Black Knights and various college and high school bands. "I like watching excellence. I like to see people doing things really, really well," he said. "It's a unique art form with a unique combination of visual and musical elements. It's just a great combination of entertainment."